At George Neiderer Pools, we provide and install Aluminum Fencing which offers the traditional beauty of wrought-iron fences without the costly and time-consuming maintenance required of other fence systems. 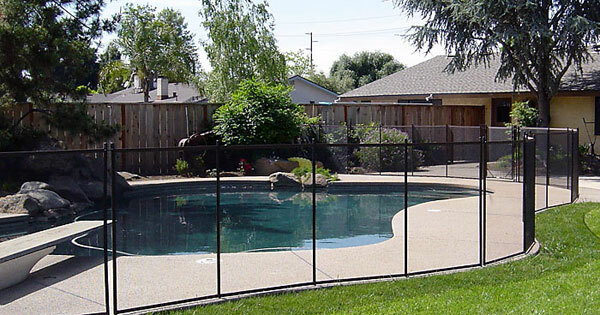 Guardian Safety Fence: "The Safest Mesh Pool Fence" — with removable, self-closing pool gate. If you are looking for a mesh pool fence that is affordable, safe, customizable, easily removable and visually appealing, be glad that you found Guardian Pool Fence. We have excelled in the pool safety fence industry for more than twenty years and has developed a security fence design so unique that it is protected by a federal patent. Our product lines contain several distinct types of swimming pool fences to address a wide array of safety concerns, pool layouts and style preferences. Residential Fences: Residential fences provide an elegant and stately accent to any home and is a perfect choice for swimming pool enclosures and perimeter fencing. The residential grade offers the classic look of a narrow picket and horizontal rail. Business Fences: Business class fences provide an elegant touch to your home or business. Softer lines are created by adding a generous radius to all edges. Gates: Our gates, available in either straight or arch type styles, add a stately touch to your walkway or driveway. Make an entrance or walkway sensational with a gate. Choose from 36" or 48" widths.